Volunteers say they were told the cancellation was because “both sides of the argument should be represented”. A DUBLIN SCHOOL that turned away a planned workshop on homophobic bullying has denied that the workshop was “cancelled”. 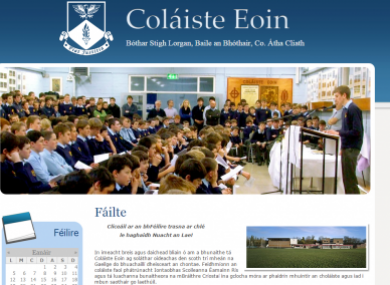 Voluntary organisation ShoutOut turned up at Coláiste Eoin in Stillorgan to hold the workshop but were told it would not be going ahead. The organisation has previously held workshops at the boys’ secondary school without an issue. Declan Meehan, the schools co-ordinator for ShoutOut, told TheJournal.ie that they were initially not given an explanation but were later told that the board of management had decided that “both sides of the argument should be represented”. The Board of Management have received written communications from a number of parents outlining their concerns regarding the workshop. In this context it was incumbent on the board to address all issues and to seek the advice available from Catholic management representative bodies available to secondary schools. The board adds that it was “at all times made clear” that the workshop was not being cancelled and that it is hoped to proceed later in the year. Not our intention to vilify the school, they have opened up their doors to us before. Today was just handled badly and was disappointing. Students at the school have planned a protest for today to demonstrate that the decision not to hold the workshop is not being supported by pupils. “We saw that the talk was cancelled and nobody’s happy about it. We want to show that it’s not the students’ choice,” according to a student at Coláiste Íosagáin, the girls’ secondary school on the same grounds. Education Minister Jan O’Sullivan told reporters this morning that the school must comply with policy on stamping out all forms of bullying. “I would certainly hope that the school examines its policies and makes sure that it is in line with national policy and that of my department in relation to bullying and that absolutely includes homophobic bullying,” she said. Email “School that cancelled homophobic bullying workshop say it will go ahead 'at a future date'”. Feedback on “School that cancelled homophobic bullying workshop say it will go ahead 'at a future date'”.